Not that long ago, the choice was clear cut: optical finders were superior in every way to staring at a small, dim, blurry TV screen at the end of a drinking straw. Making a good micro LCD panel was expensive, and even then they had limited resolution and gamut – not to mention limited dynamic range. Optical finders were generally large, bright, and of course showed a real time view of the world in both framing, and to some degree, focus. Technology has progressed and reversed: it’s now more expensive to build a good optical finder than a good LCD panel, and that’s before you consider the additional complexity that has to go into the system if the optical finder is to actually be useful. Of the three kinds of optical finder – the uncoupled framing device as seen in accessory hotshoe finders, like the one on my previous Leica M8 – is the simplest. It’s also the least useful, because it does not show the view through the lens and is therefore subject to parallax error that increases as focus distance reduces. On top of that, it does not show a representation of depth of field, nor does it show the focal plane, or even where the focus points lie. At worst, you get a hole. At best, there are some frame lines to indicate an approximate field of view; these are imprecise and usually much tighter than the actual field of view of the lens it is meant to represent in order to provide some margin of error. All that said: a good accessory finder is really a little lens in itself, and can be quite complex to design and manufacture; the advantage of this type of finder is size, interchangeability, and a very bright view (if designed well, like the modern Zeiss Ikon finders). They’re also often referred to as ‘brightlines’ for this reason. The only situation in which I’d prefer this kind of finder is if the only other option is no finder at all. Even a back panel LCD is more useful as you can always slip a magnifying hood over the top and use it as a much bigger EVF. A good TTL optical finder isn’t easy to build, because not only do the optics have to be high resolution and distortion free (and preferably also chromatic aberration free, making it easier to determine critical focus) but the distances involved must be precisely calibrated. A TTL optical finder requires that the distance between the lens flange and the recording plane and the projection plane of the finder be identical across the entire field of view; if not, then both magnification and apparent focus will change. This negates one of the biggest advantages of optical finders: the ability to determine what is in focus and what isn’t. With modern digital cameras and ever smaller circles of confusion, the tolerances have to be even tighter. I’m sure we’ve all experienced plenty of occasions where something appears to be in focus in the finder but isn’t on the final image; this is usually the result of a mirror that is either at the wrong angle (only top or bottom out of focus), or a focusing screen that is at the wrong distance (whole image consistently out of focus by the same amount). On top of that, the focusing screen and mirror play a significant role, too: the mirror must be transparent enough to let sufficient light through for the AF system to work effectively*, and the focusing screen determines both brightness and ‘snap’. *Which is one of the reasons modern DSLR finders are dimmer than old manual focus cameras: they had a fully reflective mirror instead of a partially transmissive one. The coarseness and grind of the screen affects both: too fine and you won’t have much differentiation between in and out of focus, but with a brighter image; too coarse and the image will be very dim with slow lenses. And this is before we’ve begun to consider focusing aids such as split and micro prisms. Originally, focusing screens were made of ground glass – this has since changed in modern times to be either bundles of fibre optics cut transversely, or very fine fresnel lenses to increase brightness. Both were changes in a quest to compensate for ever slower consumer lenses: try mounting an f5.6 kit zoom on a 1960s SLR and you’ll find the view incredibly dim. Yet, switch to an f1.4 prime and the the vintage camera becomes pretty amazing; bright and very easy to focus; the modern DSLR won’t improve by anything as much as you’d imagine. In reality, most modern DSLR finder systems do not differentiate much below f2.8-4, which is also one of the reasons why fast lenses appear to have a greater degree of blur in the final image than the viewfinder. Note: the focusing screen does not affect autofocus performance, since light for this system is split off at the mirror beforehand. However, there are still very good optical finder available: the one in my Hasselblad H5D and H6D, for instance. It’s huge, bright, and has both sufficient snap for determining critical focus manually (there’s a little shimmer visible in the finder caused by the frequency of the fresnel lens grid at the focal plane) and calibration is spot on: if it appears in focus in the finder, it is also so on the sensor plane. Eye relief is also excellent: it’s one of the few finders that’s both large and still completely visible, including info LCD, even when wearing spectacles and with the deep eyecup in place. Unfortunately, the replacement part by itself also costs more than most cameras. For an experience that won’t break the bank, but clue you in to just how a good finder should look – take a peek through any of the older SLR finders, or better yet, a 6×6 medium format camera with a magnifying hood: this is live view! But if there’s one thing that a TTL optical finder can’t do, it’s accurately simulate actual exposure. You see what the scene sees, you get some indication of what the camera’s meter thinks the exposure should be based on a set of predetermined parameters, and then it’s up to your individual experience to determine if you need to apply compensation or not. It’s nigh on impossible to determine precise exposure to the right simply by looking, even if you have some significant experience. On the other hand, the EVF can not only show you exactly what the sensor is seeing, but also any preview effects, for example to help visualize in monochrome. There’s also magnification and peaking for more precise focusing. Most of the problems with early EVFs revolved around resolution, dynamic range, and refresh rate: insufficient resolution to determine critical focus or examine small elements in a composition, inability to determine overexposure or even see some highlight or shadow elements, and slow refresh leading to lag and timing errors. Arguably, the former was not a huge problem if the recorded resolution was also low, but has become a signifiant one today when you’re at best seeing 1.2MP (RGBx3, 3.6MP, Leica SL) of a recorded 24MP). Dynamic range and simulations (filters applied to the raw sensor video stream) have improved significantly, to the point that the camera may well see more than our naked eyes under some situations – very low light, for instance. Refresh rate has also improved to the point that we see less lag than mechancial-optical systems. Theoretically, it stands as low as about 6-7ms for the 120fps refresh models. Add in 1-2ms on the physical shutter button, and none for an electronic front curtain camera (no opening and closing required to start exposure) and you’ve got a camera that beats out the best of the mechanicals (on the order of 15-20ms for leaf shutters, mirror up SLRs and Leica Ms; a fast DSLR can be as low as 30ms including mirror response time and first curtain opening). For video, of course, EVFs rule supreme: almost none these things are a problem because output much more closely matches what is actually able to be displayed by the EVF. The latest generation of EVF panels have only one problem left to overcome, and I’m not sure how this can be done: one of night vision. Under very low light situations, the current EVFs are like staring at little light bulbs – your shooting eye might be acclimatised for the finder, which can result in a difference between both eyes (and physical discomfort) or loss of night vision. I can still focus for astrophotography through a good finder; all I see in an EVF is a snowstorm of dots that I’m not sure are stars or just amp noise. You could dial down the brightness, but the panels only deliver full color and dynamic range gamut at a certain output level – usually close to maximum. Even if the signal is ‘turned down’ to reflect the actual scene to reduce apparent amp noise, it doesn’t change this property of the panels themselves. Perhaps OLED technology might be the way forward, where black pixels are truly not radiating any light and full gamut is available at lower luminance levels. Whilst they’re at it, we could use physically bigger panels, and higher magnification optics (you still need relay lenses for your eye to focus on a panel that’s physically often a centimetre or two at most from your eyeball). To some degree, this would drive cost up again: higher magnification means more resolution required to provide the illusion of continuity (and invisible pixels); you’d also need a larger panel and better optics for magnification and evenness. Ricoh already has this optical system >>PLEASE! Ming < thanks for this article. I think it is the MOST important element of photography. How well and pleasantly we can view what we want to photograph. Without the spark of inspiration in "seeing", it's not worthwhile pursuing! Out of curiosity, has anyone been able to connect the TV electronic viewing 'glasses' to their camera instead of a laptop/I-Pad? I’d settle for an EVF in a GR even if they didn’t or weren’t willing to do the optical finder. TV glasses: should work if they run off HDMI out? Ming, my sole experience of OVF’s in a dslr camera wasn’t very inspiring, being as it was with two 4/3rds cameras, the Olympus E-500 and the Panasonic LC-10, around 12 years or so ago. And the 1.2x magnifier didn’t help much. I did look through the v/f of an APS-C and this didn’t enthuse me with much enthusiasm either. Manual focusing with the 4/3rds bodies was virtually impossible for me, so it was as well the AF worked! I’ve never looked through the v/f of a FF dslr. Clearly, you are commenting on modern technologies and the latest iterations of them. Given that you feel that many OVF’s aren’t that good, I was wondering how you feel the best of today’s OVF’s stack up against the best (or even some of not the best) of their older film counterparts? You do touch upon this in your article, but I was wondering: are the dslr screens really at such a disadvantage in not being as big, bright, and as easy to focus? My own reference points are my Olymus OM-1, Minolta XD-7, and my Leica R7. All of which have really excellent v/f’s. I won’t include my Leicaflex or Leica SL2 (I do wish Leica wouldn’t call their modern camera the SL, as this also refers to their second iteration of film slr) as these use v/f’s which, although extremely bright and superb for viewing, can’t be used for focusing over the whole of the screen. I found your observation about the focusing ability of old slr cameras, many of which used plain old ground glass screens, very to the point. I have a number of Soviet cameras in my collection, mostly rangefinders, but the little Zenit-C slr, from the mid-1950’s, is quite interesting. This is equipped with an f3.5 Industar. I was anticipating the image to be dull, but whilst it isn’t one of the brightest screens, I find it one of the easiest cameras to focus. The point of focus is clearly delineated, and not having a central spot with a split image r/f or micro-prisms, the whole frame is more easily assessed. Oh dear – I owned and E-500 at one point too, and loved the size; the VF was worse than today’s entry level APS-C drinking straws, though! Older cameras had more snap for focusing, and were generally higher magnification; the F2 generation felt light years ahead of pretty much every other SLR Nikon made except perhaps the F6. The OM-1 is excellent, too. I never had problems focusing or judging exposure, and calibration was perfect (at least it appeared to be with relatively forgiving film). The Hasselblad V cameras are perhaps the best all round – now a bright 2 1/4″ square focusing screen is real live view – and that’s before using the focus magnifier, which still allows for full-field viewing if you rest your eyebrow on the flip up hood. Accurate? You bet – no issues focusing consistently and precisely even with the 50MP 44×33 CMOS backs. If the Hasselblad V is a 10/10, then the current H6D-100c would get a 9; the single digit bodies (1Dx, D5 etc) are pretty good and would get an 8. Of the rest, the 5D series is probably a touch better than the D810 without magnifier; with, it’s about a wash – they get a 7-7.5. Assume these numbers are normalised for format, though this is already somewhat compensated for given larger format lenses are generally proportionally darker. Thanks for the info, Ming. I didn’t bother to mention that the IQ of the rather plastic bodied LC-10 was superior to the E-500 in more ways than the small increase in pixel count. And I didn’t include 6×6 TLR cameras, although I have used them since I purchased my first “proper” camera as an 18-year old, a Yashicamat, in 1963, as I felt these were outside of the remit of your article. But you are correct about the viewing experience with the magnifier up, despite the transverse image. I have pentaprisms for both my Rolleiflex 3.5F and Mamiya C330S and whilst these are fine, I do feel a sort of detachment not experienced with the WLF. And not only MF, but a heavy Mamiyaflex, too, and with what would appear to be a large electronic flash. Judging by the amount of extension for the subject distance, I’d guess she is using the 135 lens set. Something you and she have in common, here is some info. I can’t claim I ever had one of those – I don’t think I could lift it! My mistake, Ming, but didn’t you mention very recently that you handled a 5×4 slr? OVF for composition. EVF for everything else. Wait, no mention of the XT1/2, with its highly regarded evf? And the fact that if you turn the camera on its side (portrait), all of the info rights itself on the screen? Give me that over any ovf any day. Insane that no other company have done this. The Pentax 645Z also has rotating info, at least on the rear display and live view. But I suspect you’ve never used a really good optical finder…not surprising, as so few are made these days. Ming, I still use medium format film and one of the reasons is I need a big and bright optical finder. I would love to buy into digital medium format but since they are crazy expensive, I am only left with 2 options: Fuji GFX and Pentax 645Z. Since the GFX is EVF, only the Pentax remains. You have used the Pentax extensively, how would you rate it’s finder? Compared to the 645 film system, it is just as big and bright? Is it usable for manual focus and compared to your Hasselblad, how good is it would you say? Great topic by the way! This is a big one for me. Thanks Ming. That doesn’t sound so good. If I get the chance, I’ll try one for myself, but I think I’ll stick with film instead. To summarize: I guess what you say is two things. 1) You still prefer an OVF, as long as it matches your towering requirements. 2) For 99% of the photographers, the EVF is to be preferred. I can only fully agree with that. And personally, I’m one of the 99. A very interesting article. It took me a couple of days to think about the subject. I see the old SLRs in a slightly different light: my first was a Pentax Spotmatic. Using the microprisms at the center made it very easy to focus a 50mm/1.4. Already at stop 2.8 this became difficult, and using stop 4 or less I could only use the screen. This was so grainy and dull that I had to go by “trial and error”. In later years I owned a Leicaflex SL2 for about two decades; considering the quality of the film material at that time there were no issues about focussing. The screens of the Leica R4 and R8 (which I both owned for years) were said to be inferior; I did not see much of a difference though. With recent digital cameras the demands on the equipment have increased dramatically. I just finished a large series of close-ups on highly polished metal objects using the D810 and the PC-E Nikkor 85mm/2.8D. It was impossible for me to focus “on spot”, and the focussing-aid of the camera did not help. I used to focus using the sensor, followed by a series of incremental chances of focus, and then selecting the best. On ALL of the mentioned SLRs I found it impossible to reliably judge DOF on the screen. 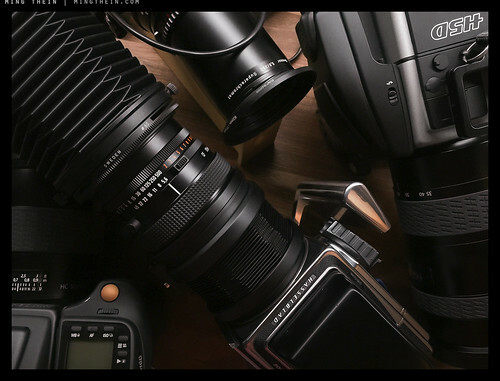 Considering the current increase of quality of sensors and lenses, I think SLRs would have to increase in price dramatically in order to get precision and reliability of their systems right. It is therefore my belief that SLRs up to FF will no longer be manufactured in the years to come, and they will be fully replaced by systems using EVF. Leica have anticipated this a while ago. Today, for me the viewer of the Olympus E-M1 II is “good enough”, the viewer of the Leica SL I find “pretty good”. The D810’s live view should be more than adequate – I made do with the much worse D800E for years while shooting watches commercially. The problem with any lens with movements, however, is that you’re never going to get accurate depiction of DOF on the optical focusing screen when shifted or tilted because of the way the focusing screen itself works (and cuts off oblique light after a certain angle, which with movements may represent most of the image). I’ve been using the Leica SL for a year or so, now, and I’m surprised to say that I am enjoying the EVF more than I thought I would. Incidentally, the EVF on the SL is not “RGBx3, 3.6MP, Leica SL”; according to the technical data sheet it’s 0.66″, SXAG, 4.4MP with 100% coverage, if that means anything to you. It doesn’t really to me. The two biggest advantages of the EVF in the SL which I hadn’t anticipated is setting the EVF to exposure simulation – rather than the EVF adjusting brightness, it shows the actual exposure which obviates the need (and the disadvantages of) the meter. It really is, wysiwyg. The other is magnification when using manual focus (M or R mount) lenses – a quick press on the joystick and you can confirm focus if you need to. Most of the time, you don’t. Leica hasn’t quite got this sorted yet, as exposure compensation cannot be set by default and the magnification doesn’t follow the metering point – it is centred, so you need to move to where you want it for each shot. But, I’m not missing an optical viewfinder as much as I thought I would. Picking up an M camera is still a pleasure, though, and very quick to focus, despite its vague framelines! The SL has the best EVF of the lot at the moment, both in terms of dynamic range and resolution, but more importantly also the optics between the little panel and your eye. • I may be in the minority this one, but I prefer not to see color/exposure settings in the finder. I want to see the scene as it is, not a finished file in the finder. I know my camera/metering well enough that I can adjust exposure comp on the fly and my results will be within the latitude of a raw file. It drives me crazy that if I apply some exposure comp to save some highlights, my viewfinder image changes. If it were possible to have a “neutral” mode for EVFs that go for accuracy of the scene vs. accuracy of the final file, I would be much happier. • I think the difference is mostly philosophical. I like to keep my visualization of a scene and final images mentally separate. Some photographers like the control and security of seeing and adjusting the final image in the finder, but I do not. I like the small element of surprise when seeing how a file appears compared to what I saw, and any serious differences I can adjust for in post. I like to think of it like film: we know how a given film abstracts the world and reacts to light, and adjust our perception to fit it. We don’t need to slave over the final file, but embrace the magic of translating a moment to an image. That being said, I do think optical finders are a thing of the past. They are at the point where they can’t be improved too much further, and technology will pass them by. And the mechanical complexity is not something to be underestimated. Besides, EVFs do have some real advantages: manual focus, for example, is an absolute joy with EVFs, but not so with OVFs. I will readily embrace it once the technology gets there. The EVF/OVF debate is a parable to my personal mirrorless experience in general: mirrorless seems to be a lot of technology without a lot of thought to the photographic experience. IMHO, cameras were perfected a long time ago (Older Leica Ms, Nikon Fs, Hasselblad Vs). Why not apply the successes of the past and adapt them to the future? I will happily go mirrorless and use an EVF once they start to FEEL like I am looking through a finder and not looking at a tiny computer. This bugs the hell out of me, too. There doesn’t seem to be any camera right now where I can get just a little information in a way that stays out of the composition, without the entirety of War and Peace. Not quite true: they are at the point where manufacturers don’t want to spend any more money on them – it’s not the same as no technology…and manual focus with a good OVF is no problem. The real problem is there are almost no good OVFs left. A very good question, and one we have to blame the bean counters for. I think that this is more a case of “different” than better, and I suspect that the type of finder may have an impact in how one “sees”. I have noticed that, without meaning to, I compose differently and use light differently on my rx-1 depending on whether I have used an EVF, or whether I have estimated the focus point and composition using a clip on OVF. This used to happen to me to a lesser extent in swapping between 35mm SLR and a rangefinder cameras, even using the same focal lengths (and now that i think about it, I will happily use a rangefinder zone focussed but wouldn’t even think of doing that with an SLR). I think of it as the visual equivalent of the difference between hearing digitally reproduced music and analogue on an otherwise the same system – different, and a matter of choice. That is an interesting observation about the different way you approach taking pics with your rangefinder and SLR. My own reaction is similar. With the rangefinder we don’t see if the image is focused or not, we rely on the rangefinder spot. With the SLR, we do see this, and it is immediately apparent if the subject is out of focus, so we are more inclined to focus. With the rangefinder we rely on DoF, but with the SLR for the most part we sight the subject at maximum aperture, which is more critical. Yes, we can do a DoF preview, but how often do we resort to it, or if it is even practical before taking the shot? It definitely does – because the finder changes what you notice, and thus what you compose for. My first system camera was a Canon EOS 300v. The finder was great when out and about with a roll of nice film and my 50mm. Certainly moving to an APS-C DSLR was a step back in visibility, but I got used to it. I am now using a Fuji and rely on the live histogram and accurate focus preview. As a result my hit rate is far higher than any other camera I have owned, and it would now be a must have feature for any new camera. Almost certainly some of it, but my shooting process has become to focus on the steps that I know will benefit the image I want to capture. Experience has meant that I have become much more intuitive with the composition that I see, but am still reliant on technology to get exposure and focus correct. 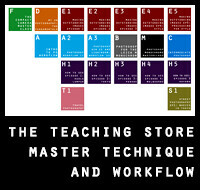 With no humour at all, it was buying a Galaxy S2 that made me rethink my workflow. The camera was decent enough for social media, but had a huge and sharp live view which rendered the scene so much more accurately than I had been used to. That was 2011, and I think phones are still ahead in that regard. What I dream about is something like the RZ67 with an EVF the size of the optical finder. Having settled into the E-M1 I don’t think I could ever be happy with a DSLR OVF ever again. Manual focus on the Oly + 12-40 or 40-150 is a joy to use, quick and easy in a way I’ve never found with modern Canons. Focus peaking alone would seal the deal for me. But beyond that, it’s the additional information I can get in the EVF: I can adjust any setting without chimping. Levels. Exposure histograms. And so on and so forth. I was using a DSLR for a couple of weeks late last year and it felt so clunky – and it wasn’t just the size. Yes, I noted when replying to someone else, I have fond memories of using a 70’s Minolta as a kid, and that was a whole other experience compared to modern DSLRs – I found myself wondering if I’d somehow become incompetant in the intervening decades! My only criticism of the extra information is that most EVF implementations could allow a little more flexibility in what is on there (as opposed to 3 or 4 canned combos); but then there’s still more flexibility than most SLRs allow! BTW, on my E-M1.2 I notice that the EVF is quite grainy, but after taking the shot the preview is much more detailed. I wonder if this is due to some setting, or it’s like that by default. Could be the boost setting? Or the high frame rate setting? I’m not really sure what’s going on, but from the start I have had the feeling that the EVF image isn’t quite as crisp as that on the original E-M1. Just checked the settings on mine. I don’t see any difference between the high and normal refresh rates, the EVF image seems the same. Live view boost and S-OVF modes don’t affect the refresh rate and apparent sharpness either, same goes for peaking. Olympus did a good job there in that you can basically use any settings you like without obvious compromise. Still, the EVF image seems a little bit soft. On an E-M1.2 there’s a live view boost option that uses longer shutter speeds, and I could focus an f/4 lens in very dark conditions. This is best done on a tripod though, but could be done hand-held, but you need to hold the camera really steady, as it’s pretty difficult to focus when the EVF refresh time is ½s. very interesting and useful read! i think there’s one element missing. most of us make photos for pleasure, with perhaps some profit or other motivation thrown in as a secondary factor. the same way that the haptics of a beautifully engineered object adds to the pleasure of making photographs, the visual experience of looking at the actual light coming from the actual world is a key element for me. an EVF might be brighter, it might have less lag from click to capture, it might match the exposure or not, but it’s still a little screen inside a little tunnel. call it a lack of, dynamic range, gamut, discrimination, color accuracy, whatever, it just isn’t the same as the actual light from the scene hitting your eye. if i was mostly making images professionally, i’d be more willing to set that aside in the interest of more accurate focus or previsualization of the exposure, etc. After exclusively using an EVF camera for a while (Olympus E-M1.1), and now using a mix of liveview and OVF cameras (Ricoh GR, Sigma DP3M, D810, etc. ), and finding myself to be an unexpected fan of OVFs, I think the exposure preview function of the EVF is actually a weakness. When we see the scene with our own eyes without the camera’s exposure and gamma functions altering it, we can see all the exposure and compositional possibilities, whereas an exposure preview locks you into one interpretation of the scene, and you may miss out on some compositions. Yes, you can remove the camera from your face and look at it with your own two eyes, and that’s what I do most of the time, but I think with a little bit of experience and practice, an OVF or, better yet, your own two eyes, are the best things to look at a scene or subject. The best display panels have around 1000:1 contrast ratios without playing tricks, so that’s at most a 10-bit dynamic range, and a lot of information is being thrown away. That’s also an interesting thing to consider when viewing images on a monitor. You use a loupe for critical focusing with your Nikon DSLR in LV, with manual lenses. No need for one with the Hasselblad, I believe? Not quite: I used a loupe with LV when in the field for critical focusing – on a tripod, I don’t need it. For me, the loupe is for brace-against-head stability, not magnification. If I want a LV/EVF Hasselblad, I’ll use the X1D. But the optical finders on the H-series are so much better than the Nikons/Canons, it isn’t necessary. As always Ming, good topic=learning opportunity. Question ( as I am deciding on a next camera/system). Is part of this decision based on how the camera is being used? Meaning street, which is my priority versus fine art studio work or models or architecture, etc. Thus street the emphasis/priority is based on content, all else like exposure for the scene, exact focusing is secondary. Would you agree? I think so. I prefer optical finders for documentary work, partially because they show the most information and have the least lag; in the studio or for tripod based work, I work with live view all the time anyway, usually on the back LCD – so to that degree, I don’t even really need a finder. Thanks agin Ming for the follow-up and once again- good learning topic! Years ago I built a stereoscopic first-surface mirror porro (pentaprism) viewfinder for my large format (4X5 and larger) SLRs. Contrary to my intuition, there was something very special to looking at a magnified image of the ground glass or of the Beattie Brightcreen with both eyes. The image was subjectively perceived as 3-dimensional, at least, as stereoscopic. There was truly something to the fact that the eyes were seeing different sides of the grains of the ground glass resulting in the effect that I have failed to quantify. Ultimately though, viewing pleasures aside, it is all about your final image. Currently, for studio work, for me, nothing beats a tethered setup with ability to see the scene on a large screen, to be able to zoom in and check critical focus, etc. A tiltable external EVF is the next best current option, for work outside of studio. Ideally, the camera is to be a separate unit, like a digital back. The viewing accessory absolutely does not need to belong to the body of the camera itself, and had better be a separate screen or an electronic viewfinder. Perhaps, some sort of goggles, in near future. OVFs, of course, have their uses and their users, and they will, for awhile. Rollei and Heidecke had already thought along these lines in 1959/60 when they introduced their binocular hood for their Rolleiflex, and some Rolleicord, cameras. I slide mine over the erect hood and as it incorporates two lenses, spaced like spectacles, it affords a pseudo “stereoscopic” view which provides a more relaxing viewing experience than the single lens. In use, the hood, usefully, offers two more advantages: it cuts out more extraneous light than the standard hood, and as the lenses are further away from the screen it affords a slightly higher degree of magnification than the hood’s built-in magnifier. Thanks, Terry. Didn’t know such thing existed. There are also binocular ground glass viewers for traditional (non-SLR) large format cameras. Both they as well as the hood you pointed me at, present an inverted view of the scene. For that reason I was never a fan of chimney finders, albeit have used them. I never liked the flipped and inverted ground glass image even more strongly. For that reason I have created my own prism, which allowed me to use a large format camera like a traditional modern SLR. To each his own. Of today’s choices I like those clip-on electronic viewfinders. I use them on several camera systems. And I hugely prefer them to built-in, non-tilting EVFs of more recent digital cameras. Fuji is definitely doing it right with their GFX – a truly groundbreaking camera system with very bright future. The Rollei hood does not give an inverted view. 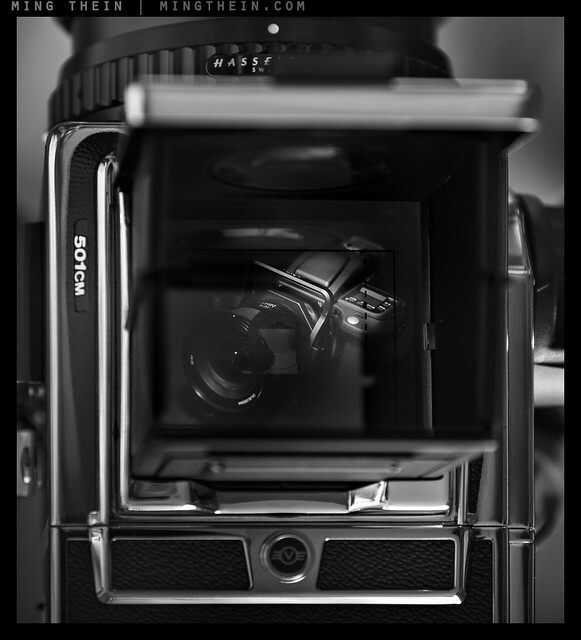 As you may know, conventional film TLR’s provide an upright view, but one that is laterally reversed, when using the standard hood. The 5×4 screen image already starts out inverted, unlike the Rollei. I am in full agreement with your views on clip on EVF’s as opposed to the built-in fixed variety. This informed my purchasing decision a few years ago to buy the Sony Nex 5N and the fairly basic Olympus EPL-1. Re-reading your post I know believe you meant that when using the Rollei hood on your 5×4 you still had an inverted image, not that when used on a Rolleiflex it would invert the image. Apologies. Terry, friend… The more you re-read my message the more confused you were becoming. I was describing my custom prism built for a large format SLR. The SLR abbreviation was key. Few people know of former existence of large format SLR cameras, but they are still around. My porro prism does exactly what i.e. a Mamiya TLR porro prism does. Mounted on a Rollei TLR it would act the same – it delivers fully correctly-oriented image. Furthermore, my prism was designed and built for STEREOSCOPIC viewing at a comfortable ~ 30 degree angle, similar to corresponding prisms by Hasselblad, Fuji, Rollei, etc. Just like we see in our favorite tiltable external EVFs. I will disclose one little secret here – you can mount the Olympus EVF on top of their recent flagship camera, OM-D E-M1. Mine are “welded” together. The resolution and the optical formula in both the built-in and clip-on viewfinders (you should use their latest, albeit, I hear, any generation works) is same – i.e., very nice and usable. The latest Olympus flagship OM-D E-M1II no longer offers this functionality, which only affirms my yesterday’s statement. Now, SONY NEX 5N, 5R, 5T are fantastic cameras (I have and use them), except their tilting EVF (its optical block) is inferior to the less expensive Olympus’. The newest FUJI GFX shines with its fully articulating (finally!!!) EVF. I have yet to see it in person, but the concept is stunning – full modularity, a huge lens flange, etc. If I will consider purchasing another camera, the GFX is at the top of my list. … Ming, your comment on a tethered setup with an iPad is something I have been considering for a long time. I am now building a very special studio camera and this viewing option is most likely. I have a keen interest in the history of photography and a modest camera collection. I was aware, then, of the early large format SLR designs with their enormous chimney-like hoods. No wonder that during this era a Rollei TLR was designated a miniature camera, only becoming medium format when 35mm assumed the miniature mantle. Thanks for you more detailed description of your bespoke setup. I now appreciate what you have done. As for the Olympus add-on EVF I, too, was surprised at its superiority over the Sony. I’m not sure if it was considered a necessary feature of them all, but given the sheer physical size of most of these cameras, it wouldn’t have added much to their overall weight and as has been considered in this post, it does seem to aid for better focusing and which could have been very useful given the relatively slow speed of the lenses of that ear and dim image on ground glass. The device is in two parts, the metal frame that attaches via the tripod socket and allows it to be positioned accurately over the screen, and the hood itself which is attached to it via small bar magnets in the hood. It can be attached for either eye viewing. With its 2.8x magnification, the image is huge and despite the relatively low resolution of the screen itself, it is a good aid to focusing when using legacy, manual, lenses. The listing refers to a sticker. Ignore this, there is no adhesive or glue required, it is a quaint translation for the magnetic mount! Thanks and, no – I was never looking for this type of NEX3/5 accessory, and therefore didn’t know about this one. Honestly, I do not understand the point. First, the natively available imperfect accessory EVF’s resolution is higher (I hope to be correct here) than the LCD. Next, just why? I can see using a clip-on hood with magnifier when and only when there is no other viewing option. I sincerely hope you are not confusing yourself into thinking that this way you are achieving higher magnification = clearer image, or what is often called a “large viewfinder”, am I right? I vote for larger and brighter viewfinder view, who wouldn’t… But, people often marvel at the size of the viewfinder in a medium camera not realizing they are fooling themselves. Do yourself a favor, put a medium format SLR camera (no lenses necessary) against one eye and a reference 35mm camera to your other eye. Look through both. What do you see? You will be surprised to see … about the same size image of the ground glass of either camera. Yes, they are different, but not THAT different. There is a significant psychological factor at play here – you EXPECT the viewfinder of a bulky medium format camera to be larger, but it usually is not. Not at all, or not by much. Neither is it particularly brighter, especially so that your medium format lens of choice is typically slower than a 35mm camera lens. I do not doubt that some optical viewfinders are particularly nice and bright, and precise, as Ming is saying. Good. That is a serious optical achievement. Now let’s go back to those digital viewfinders. They too are all about the same [image] size, at least all recent and decent ones are. Why is that? Simply because the angle (“cone of light”) your eye is capable of encompassing without “panning” is limited and fixed. It is like a fundamental universal constant. Furthermore, limitations of creating an optical system responsible for magnifying the image of the little “TV screen” so that your eye is seeing it as filling that angle are simply limitations of the laws of optics. This is why the perceived angular size of the image created by any optical instrument from a microscope to a telescope is … about the same. The beauty of an electronic viewfinder is the ability to selectively zoom on your image for precise focus. Focus peaking or other electronic focusing aids are also welcome. These features are not available in any optical viewfinder, no matter how nice. Yes, there are viewfinder magnifiers (especially, the angular ones, and I have used them for years), but you have to have the best and most precise (and precisely calibrated in terms of its positioning, as Ming often says) ground glass, to read the image from. None of these problems are present in viewing an electronic image lifted right off the imager. So, back to your accessory – I, frankly, see no need. Thanks. Ignoring the lack of resolution question, and which in some circumstances is not resolved even by the higher res Sony EVF, these are very cheap, a couple of Starbuck’s coffees, and do have advantages. You’ve mentioned stability for one, and they are very effective at this, even better, IMO, than viewing via the add-EVF simply because the large rubber eyecup fits so snugly against the forehead and upper cheek and which allows the camera to be pressed more closely to it without it being uncomfortable. And it cuts out all extraneous light. Speaking specifically about Sony’s Nex 5N, it has a single master connector and which accepts an optical finder, stereo microphone, EVF and flash unit. But only one at a time, and this is its Achilles heel. If shooting video and the external mic is attached, then one has to resort to the screen, and if it also happens to be a nice sunny day, even in the UK we get these well, ’nuff said, trying doing it. For an amateur like me, and using AF lenses, the hood finder is a boon and the “roughness” of the video image is less important than most would imagine. I totally overlooked the cost aspect of the accessory you use. This alone speaks volumes in its favor. We both enjoy the little marvel that the 5N/R/T is, right? I agree with you – you get the same effect even on a 6×6, though not as much as the 4×5 of course. Now, just suppose camera makers allowed for a choice of the viewing optics of the EVF. You could state the focal length of your preferred prime and have the viewing angle of the EVF the same as for the other eye. And you could then keep both eyes open – at least part of the time. Not really – it IS significant, given that good finders are one of the first things to go when products are designed to a price. In reality, the relay optics systems are complete lenses in their own right…it’s marginal on a H6-level camera, but then you’ve got other problems with volume and economies of scale. A replacement finder is about $1700 as it is, I think. That said, it’s probably the best SLR-type finder I’ve used: the eye point is very high, I can see the entire thing with my glasses on, there’s no distortion, it’s bright, crisp and you can actually differentiate focus accurately. I do like the fact that on my D810 I have a choice of using the optical finder or the LV screen so I have the advantages of both (at the price of the extra weight in the camera and the bigger lenses vs non-SLRs). Or adding a Zacuto and making a really big EVF. I’ve never seen an EVF that I could live with and I think that is partly one of the reasons why I slowly drifted away from digital and back into film. I was a mirrorless digital shooter for many years and grew more and more dissatisfied with EVF’s even as they were supposedly getting better. I just could never shake the feeling that I was watching my subject through a TV instead of in real life. Now I shoot primarily rangefinder film cameras, with a smattering of SLR film on the side. Worlds better for me. Yes….. “live” view versus “reality” view. Well, one uses actual photons reflected off the scene. The other has to go through some digital processing…steak, vs hamburger. Two important points I missed in this article; eyesight and the simulated OVF (Olympus). Perhaps an OVF is still sufficient for millennials but for some of us boomers, a good EVF is mission critical. There’s nothing more satisfying than dialing in a few clicks on the diopter to focus in a good EVF on a new camera, except maybe seeing the much needed and much appreciated peaking lines and magnification for the first time. For me, and OVF is a non-starter due to my eyesight which aint what it used to be 😉 I doubt I’m alone in this. 2ndly, the simulated OVF feature (which I thought was ridiculous at first) is now set to a custom button on my MII for low light shots as it lights the scene nicely (rather like night vision) without all the noise. True, you do lose all the benefits of an EVF buy its better than looking at darkness and/or snow. Great article Ming, really enjoyed it. In my opinion, all viewfinders are flawed. It is simply that some are less so than others. We are forced to stare into a single viewfinder, although we have two eyes with which we see a 3D world. What is worse, with very few exceptions, optical v/f’s present us with a less than full-sized image, and with an EVF it is technically possible to provide an image larger than life. Many find this a strain on their eye. Now wouldn’t it be nice if we could view without 99% of the deficiencies of both and use both eyes for a less fatiguing viewing experience, see the subject naturally and life-size, in natural light, and have the widest possible view of what surrounds the subject and which even the best optical finders can’t equal and which also presents the user with no optical distortions of its own? This has been possible since 1951! Is it nirvana? Sadly no, as the system introduces problems of its own. Some find that they can’t adjust to it and it simply doesn’t work for them; each unit is set for a single focal length only, although there is a choice of three to chose from, and it suffers from most of the issues highlighted by Ming. And it does require the user to have two eyes for its unique viewing experience to work and be appreciated. Now just what is this magical 61 year old system? If you’ve made it to this point, you deserve to know. It is the Voigtlander Kontur finder in models for a 50mm lens for 135 film, 6×6 and 6×9 for roll film. I have those for the 50mm lens and 6×6 although I have read that there exists one for a 35mm lens for 135 film, but this is extremely rare. The viewfinder itself is blacked out, save for bright line frames and which are all one will see when looking through it. The “magic” occurs when you place it to one eye but keeping the other eye open. What you are now presented with are the bright lines seemingly suspended in space in front of you, but the FoV is that of your other eye. As I mentioned earlier, it still has operating deficiencies, but for those who own them, it is an experience using them like no other. Both eyes: interesting, but there’s a problem: it would force us to view the world stereoscopically, which the camera can’t capture…or can, but digital reproduction media can’t generally handle. Ming, actually, no. Only one eye is used to view the subject, so it is not stereoscopical. It is just like placing a hand over one of your eyes whilst viewing with the other. The Kontur itself is blacked out, so the only light reaching the eye is that which passes through the translucent frame lines. Looking through it you will not see anything of the subject at all, just the frame lines. Our brain “sees” two disparate images, the subject and the frame lines. It is the brain’s combining of these images that fools us and explains why some can’t use the Kontur. As far as I can tell, without dismantling one, it just has exit optics and which are used to give an apparent distance for the eye to focus on, I suspect around 1m, which seems to be the norm in camera v/f systems without dioptre adjustment. To see, is to believe, so they say, and it really is quite a magical act using a Kontur, despite its other limitations, including parallax, of course. Got the chance to play with the Fuji GFX for a half hour last week. The EVF seemed really good, large. At least in conditions where there was light it worked really well. Did not have the chance to test in dark but I think the bright screen problem in the dark would still be there. But having not tried the SL , this seemed like the first EVF that I could really live with. EVF apparent size (magnification) has more to do with the finder optics than the panel: this bit is actually pretty critical, and I’m surprised so few camera makers get it right (Panasonic was notoriously bad for a while). Indeed, and one of the most crucial things to the user. E-M1.2 is better in low light situations than the previous generation, as it can automatically adjust the EVF brightness to very closely match that of the scene. The EVF luminance is now less of an issue, but not completely eliminated. The refresh rate is high enough and blackout times so short that following action is no longer a problem with EVF’s. Some more resolution is still needed, around 2 megapixels would be perfect. The Leica SL and Leica Q are the only ones getting close, both E-M1 and X-T2 are still running 0.8 megapixel EVF’s. True, but it’s still the worst of both worlds: blacks that aren’t truly black (like an optical finder) and if you set it to mirror the scene brightness, then you lose the exposure preview advantage of an EVF. I don’t think the blackout time has been a problem for a while, actually. Blackout time can still be a problem in many mirrorless. Fuji X-T2 can only shoot 5 frames per second until it starts showing you a slideshow of the captured images, not real live view. The E-M1.2 runs circles around it in this regard, and actually even the original E-M1 trumps it after firmware updates. first available in 2014…this applies to video out (video, LV, EVF) from all cameras using this sensor. Indeed, the fuji rep implied as much. Ming, do you know if the 100Mp sensor is similar, or has it a faster readout? Not really necessary I guess for the work its intended for? Much faster readout – LV on my H6-100 is noticeably better than the H6-50…it’s also one generation newer. That’s 3.69M dots, not pixels. 3 dots needed for one pixel (RGB), so true resolution is only 1.3 megapixels. Don’t get me wrong, that’s still a very respectable resolution for an EVF. …but less than the ~2MP the sensor can video output. .8 megapixel EVF? Don’t you mean .8 magnification? The EVFs for the E-M1 and X-T2 is 2.4 million dots. One pixel is represented by RGB (and sometimes L) dots, which are disingenuously represented by the manufacturer. Panel resolution is often 800×600 or 1024×768 – which is 0.8MP. 3 dots are needed for one pipeline. One red, on green, on blue. The real resolution is 1024×768 or about 0.8 megapixel. *pixel, not pipeline. Damn autocorrect! I’m sure the manual focus aids in today’s DSLRs could be improved significantly. Why not light up the focus points that are in-focus and perhaps 50% for those that are close (indicating direction of adjustment). The current Nikon indicator at least is very impresice (compared to the actual AF) and requires looking at the bottom of the screen. Fixing that would at least make manual focusing possible with the modern finders. Did you find the finder of the Pentax 645z reasonably precise fir focusing? It its considered one of the better finders, but with GFX and X1D around the corner things are getting competitive. Do the screens of the 645n fit natively or do they need to be cut? 645N needs to be cut, 645NII does not. “Why not light up the focus points that are in-focus…” that is exactly what my Canon 6D does supported by the special matte screen from Canon named Eg-S. If only Canon would show a focusing balance in the viewfinder to easily see distance and direction to in-focus. Although the Canon 6D with Eg-S is that precise (and can further be calibrated) that I returned a Sony A7 since the Canon is much faster to focus manually than the Sony. IMHO EVFs only work good enough with AF-lenses. The Nikons also light up in either of the ‘Auto’ modes. I think Tarmo wants the focusing points to also act as focus dot confirmations: the focus point would light up when the area it’s covering is in focus. One of the problems with the focus dot is that you need to look down in the finder to see it. This would be great for using manual focus, assuming you’ve calibrated yourself and the camera. The Canons do this, too. They even beep when you hit focus (at least my 5DSR did). > IMHO EVFs only work good enough with AF-lenses. I would have to disagree with this, quite vehemently. Focus peaking and the Olympus lenses with the MF choke (the pros and the 17/1.8) are an absolute joy and blessing. It was like being a kid and playing with my dad’s 70s Minolta again. I routinely use MF on my Olympus in a way I never did on DSLRs, which I find basically useless by comparison with either old pre-AF film cameras, or the Olympus. 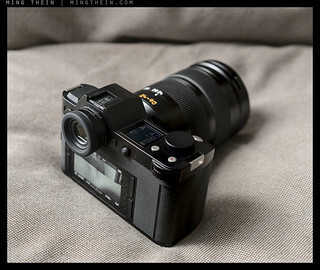 The Fuji X100 series have both optical electronic viewfinders. In aeryecet arrangement. Surely this type of technology might be the best of both worlds. X100 in OVF mode doesn’t show what is in focus and what is not. It does show an approximate focus area indicator, but you still can’t be sure what it is actually focused on. To make matters worse, it’s offset both horizontally and vertically from the lens axis, so parallax errors are a real problem at closer distances. It’s workable but basically not much more useful than an add-on VF, IMO. I’ve also never figured out this: if you focus on what’s under the box, but it only shows you parallax compensation and what it actually focused on after it focused…isn’t that a bit chicken and egg? Every time you compensate it will shift again – and there’s no way to know beforehand since it has to actually do the focus procedure to determine distance (and thus parallax). I suppose this is why the Leica M10 remains an option for me for a range of applications. Optical / rangefinder viewfinder for most, and EVF as an optional attachment when needed – the new one for the M10 is not perfect but a huge step up from the ’50s TV-like one for the M240. The EVF on the SL is the only one I have ever really liked. The one on the X1D is passable, if disappointing in 2017. I have yet to handle the GFX, but it is OLED apparently and quite hi res. You know, until I read your article I had never considered the issue of relative luminance through an EVF v the actual scene at night. Anyway, I don’t think we are far from EVF winning out. Meantime perhaps high end SLRs could include an optional EVF for the hotshot? A D810 with such an optional attachment would be a winning combination. X1D/GFX: the limitation isn’t the EVF spec: it’s the video readout rate of that generation Sony sensor; every LV application from that sensor looks rather…rough. There’s a massive difference between that and the 100MP latest generation…it’s much like the difference between the D800/D810’s LV properties. The uncoupled viewfinder has a great advantage that it shows whats outside of the frame, perhaps about to enter it so can be a great for say street photography. On a Leica M – in my case an M6 – what one sees in the viewfinder is the same size as what one sees with the naked eye. Because of the use of frame lines, the focal length of the lens makes no difference (the change in image size in the Contax G1 and G2 drove me cracy). In fact, on can shoot with both eyes open. With an SLR, one is looking through a tunnel; or hiding behind the camera. Waist level viewfinders involve a different sense of environmental awareness – although the fact of the image being flipped in the glass poses problems and opportunities. It’s possible to use an articulating lcd as a waist level finder of course. Horses for courses, of course….. Your M6 doesn’t, in fact, offer life size viewing. Models prior to 1997 have a .72x magnification, when in 1997 it was increased to .85x, very closely approaching that of the M3. If you have the .82x model you will see this confirmed if you look at the front element of the viewfinder where you will see, if you look carefully, a small .82 has been laser etched to the strip at the bottom of the screen.